Aryne or benzyne is an intermediate that is obtained when treated halobenzene and strong base via an elimination-addition mechanism. When treating chlorobenzene with sodium (or potassium) amide, benzenamine (aniline) is obtained. This substitution follows a mechanism similar to nucleophilic aromatic substitution. But when this reaction is performed with radioactively labeled chlorobenzene (14C at C1 bonded to chlorine, indicated with an asterisk), a different result is obtained. Only half of the product is substituted at the labeled carbon, and in the other half, the amino group is at the adjacent position. STEP 1. Elimination – this is not a concerted process, but rather takes place in a sequential manner. Deprotonation is first and then the departure of the leaving group. Deprotonation takes place ortho to the halide because the halide’s inductive electron-withdrawing effect acidifies this position relative to the others. Although deprotonation is not easy, the departure of the leaving group is even more difficult because it is obtained reactive species, called 1,2-dehydrobenzene or benzyne. STEP 2. 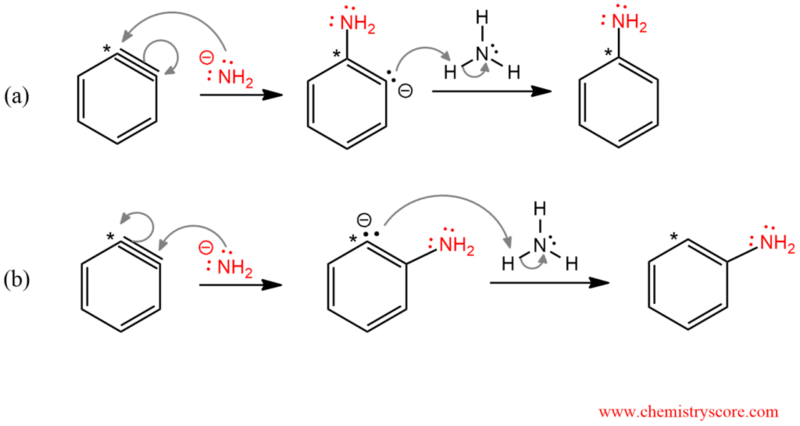 Addition – Benzyne which is produced in the previous step is unusually reactive because of a cyclic structure with a triple bond which is forced to be bent. This intermediate does not survive long because it is quickly attacked by the nucleophile, and this can be performed on any atom of a triple bond.